(CNN) - Two very different views of the Environmental Protection Agency are set to clash on Wednesday, when acting Administrator Andrew Wheeler testifies at his confirmation hearing. Wheeler, a former Republican Senate aide on environmental issues and coal industry lobbyist, will "highlight the progress EPA has made under President Trump," an EPA spokesman said, including cleaning up toxic Superfund sites and proposing new air and water pollution regulations. Senate Democrats, however, see a weakening in standards "at the expense of the agency's mission to protect the environment and public health," a Democratic committee aide said. They're concerned about his lobbyist past and how the agency is handling the ongoing government shutdown. 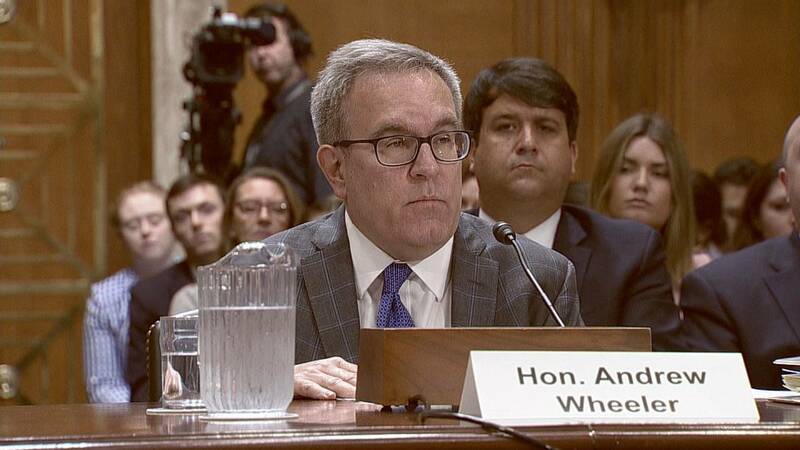 The Wednesday morning appearance before the Senate Environment and Public Works Committee, will be Wheeler's second confirmation hearing in about 14 months. He served several months as deputy to EPA Administrator Scott Pruitt, who resigned last summer while embroiled in ethics and spending scandals. President Donald Trump applauded Wheeler's work and formally nominated him to the position earlier this month. Here are five things to watch for in the hearing. Republicans see a rollback of rules that were hobbling the economy. Democrats see the destruction of environmental and health guardrails. Expect to hear questions about the EPA's plans to reform regulations for power plants, water pollution, vehicle emissions and mercury. Among the industries that have benefited from the changing tide at EPA is the coal industry. Wheeler's clients as a lobbyist included Murray Energy, the coal giant whose CEO gave the Trump administration a wish list of regulatory changes. Wheeler's allies also point to his focus on the Superfund National Priorities List. The agency says more sites have been remediated and removed from that list than in any year since 2005. The day before the hearing, an environmental group released a new report claiming the EPA's "criminal enforcement program was missing in action" last year. Public Employees for Environmental Responsibility documented a decline in criminal referrals to the Justice Department by EPA investigators. It said referrals in fiscal year 2018 were 60% lower than the same period in 2011, and the 166 referrals last year were the fewest in 30 years. In 10 of those 30 years, EPA referred more than 400 cases. "These figures indicate that the Trump plan to cripple EPA is working," said Kyla Bennett of PEER. Wheeler hasn't addressed publicly how his agency is incorporating the findings of a major government climate change study released over the Thanksgiving holiday. He has questioned the report's "modeling" and criticized media coverage for, in his view, focusing on the worst-case scenarios outlined in the report. Trump has said he does not believe the report's findings. Days after the report was released, the EPA announced plans to cut restrictions on new coal power plants. Environmental groups say the Trump administration has been hostile to climate change warnings since day one, citing a long list of actions including the removal of climate change data from the EPA website and strategic plans. "It's an embarrassment. It is a ghost page," a former EPA regional administrator, Judith Enck, said in a report prepared Tuesday by the Environmental Defense Fund. While the ethical questions surrounding Wheeler are less dramatic than the scandals that dogged Pruitt, the topic is still likely to come up at the hearing. On Tuesday, Citizens for Responsibility and Ethics in Washington called for an investigation into whether Wheeler violated his ethics pledge by attending meetings and events where his former clients were present, and by working on power plant regulations. The EPA has previously said Wheeler's meetings have complied with ethical requirements. "Mr. Wheeler's meetings and regulatory activities in furtherance of his former clients' interests give rise to the appearance of privileged access and influence and undermines the very purpose of the Ethics Pledge," wrote Noah Bookbinder, the executive director of CREW, in a letter to the EPA inspector general. In a separate report, the Project on Government Oversight said Tuesday that in 2017, Wheeler held a fundraiser for Wyoming Sen. John Barrasso, the Republican who will chair Wednesday's hearing. "In the two weeks surrounding the May 2017 fundraiser, Senator Barrasso received more than $100,000 from 47 corporate donors," the POGO report reads, citing Federal Election Commission data compiled by the Center for Responsive Politics. Wheeler's appearance on the Hill comes as the majority of his agency's employees are out of work due to the government shutdown. Of the nearly 14,000 EPA employees nationwide, 891 have been kept on, according to the agency's shutdown plans, which were updated on Monday. Furloughed workers include those who monitor compliance with federal air and water standards. Several of the committee Democrats raised concerns with Wheeler's preparation for the hearing, which required some EPA employees to work during the shutdown. "More disturbingly, if EPA is diverting resources that are intended to be used to 'protect life and property' to prepare you for your confirmation hearing, the already-dire consequences of the shutdown on public health and the environment could be even greater," the senators wrote in a letter last week.